Due to the racial wealth gap, black families have far less in savings than whites. The consequences can be far-reaching and often severe. If you are black, you’re far more likely to see your electricity cut, more likely to be sued over a debt, and more likely to land in jail because of a parking ticket. It is not unreasonable to attribute these perils to discrimination. But there’s no question that the main reason small financial problems can have such a disproportionate effect on black families is that, for largely historical reasons rooted in racism, they have far smaller financial reserves to fall back on than white families. The most recent federal survey in 2013 put the difference in net worth between the typical white and black family at $131,000. That’s a big number, but here’s an even more troubling statistic: About one-quarter of African-American families had less than $5 in reserve. Low-income whites had about $375. Any setback, from a medical emergency to the unexpected loss of hours at work, can be devastating. It means that harsh punishments for the failure to pay small debts harm black families inordinately. Sometimes, the consequence is jail. Other times, electricity is cut, or wages garnished. The modern roots of the racial wealth gap can be traced back to the post-World War II housing boom, when federal agencies blocked loans to black Americans, locking them out of the greatest wealth accumulation this country has ever experienced. More recently, the bursting of the housing bubble and subsequent recession slammed minorities. In 2013, the median wealth of white households was 13 times the median wealth of black households, the widest gap since 1989. Earlier this year, my colleague Annie Waldman and I took a close look at debt-collection lawsuits in three major American cities. We expected to see a pattern driven by income, with collectors and credit card lenders suing people most often in lower-income areas. But income was just half the story. Even accounting for income, the rate of court judgments from these lawsuits was twice as high in mostly black communities as it was in mostly white ones. In some neighborhoods in Newark and St. Louis, we found more than one judgment for every four residents over a five-year period. Many were families who, knocked off their feet by medical bills or job loss or other problems, had simply been unable to recover. When debts turn into court judgments, plaintiffs gain the power to collect by cleaning out bank accounts and seizing wages. Federal and state laws generally don’t protect anyone but the poorest debtors, and because judgments are valid for a decade or more, the threat of garnishment can linger for years. The paycheck from that new job may suddenly be slashed and savings may disappear. Sometimes the consequence of not having the money to pay a bill is immediate: The power goes out. In a 2009 national survey of lower-income households by the federal Energy Information Administration, 9 percent of blacks reported having their electricity disconnected in the previous year because they had been unable to pay. For whites, the number was less than 4 percent, according to an analysis of the survey by the National Consumer Law Center. And sometimes the consequence of unmanageable debt is to fall further into debt. In a 2013 Federal Reserve survey, about three times as many blacks reported taking out a high-interest payday loan in the previous year as did whites at the same income level. Desperate consumers turn to these loans as a way to catch up on bills, but often get tripped up by unaffordable interest payments. Federal survey data shows that there is a wide gap between the financial resources of white and black families, even when examining families with similar income. Source: Federal Reserve, 2013 Survey of Consumer Finances, ProPublica analysis. When combined with discriminatory policing practices, the effect of the asset gap is to magnify the racial disparity. In its report on the Ferguson, Mo., Police Department, the Justice Department found that officers disproportionately stopped and ticketed black citizens. For a “manner of walking” violation, it was $302; for “high grass and weeds,” $531. Blacks accounted for about 67 percent of Ferguson’s population and around 85 percent of the municipal court cases. But the numbers were even more lopsided when it came to the harshest consequences. Blacks accounted for 92 percent of the cases where an arrest warrant had been issued to compel payment. And this wasn’t a problem only in Ferguson. Earlier this year, the American Civil Liberties Union sued DeKalb County, Ga., which includes part of Atlanta, for jailing citizens over unpaid court fines and unpaid fees charged by a for-profit company that runs probation services for the government. About 55 percent of DeKalb County’s population is black, but the ACLU found that nearly all probationers jailed for failure to pay those fines and fees were black. The racial wealth gap “creates this cyclical effect,” said Nusrat Choudhury, an ACLU attorney. An unpaid speeding ticket may result in a suspended driver’s license, which may lead to a more severe violation. 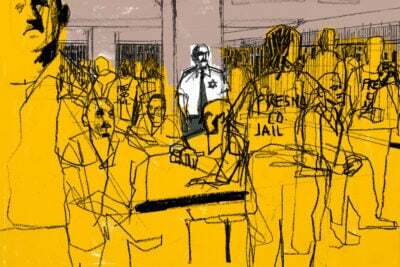 Unable to pay their fines, black defendants become more crushingly entangled in debt. Cori Winfield, a single mother in St. Louis, got caught up in this cycle. After she was unable to keep up the payments on a subprime auto loan she took out in 2009, the car was repossessed the next year, but the consequences didn’t stop there. Because the debt continued to be bloated by interest charges, the lender began garnishing her wages in 2012. The garnishment continues today. Because she was unable to repay, she will end up paying far more than she owed in the first place. Making matters worse for Winfield, while her wages were being garnished, she was arrested for driving with a license that had been suspended because she had failed to pay a speeding ticket. She ended up spending a weekend in jail and having to pay the cost of bail. Winfield has a decent clerical job, earning about $30,000 a year. But she lives month to month. When hit with an unexpected expense, she is left reeling. Her vulnerability is typical. In a recent survey by the Pew Charitable Trusts, the typical black household earning between $25,000 and $50,000 reported having emergency savings of $400. The typical white household in that range had $2,100. Black families were much more likely to report difficulty in recovering from a financial setback or to have fallen behind on a bill in the past year. This financial insecurity extended up the income scale. Of black households with income between $50,000 and $85,000, 30 percent said they had been unable to pay a bill. By contrast, only white households with incomes below $25,000 reported similar trouble paying bills; 31 percent said they had fallen behind. What can be done? The best place to start is by identifying practices that are particularly damaging to black communities, and then fixing them. In Missouri, for example, the attorney general recently proposed a series of reforms for debt-collection lawsuits to ensure that the underlying debt was valid and that lawyers’ fees were not excessive. Collection-industry trade groups supported the proposal. 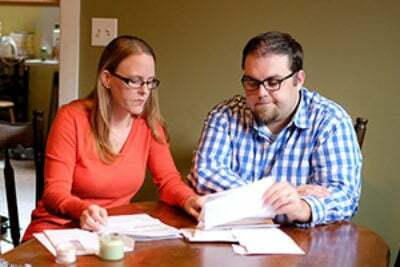 Lawmakers in Missouri and other states could go further and reduce the amount of income subject to garnishment. In most states (New York and New Jersey are exceptions), defendants can lose a quarter of their post-tax income, a big hit for even middle-income families. Bank accounts are afforded even less protection, allowing collectors to seize funds without limit. It’s a nonsensical system that restricts how much of a worker’s paycheck a collector can seize, but allows collectors to take the entire amount once that check is deposited. Setting even a small dollar amount as automatically off limits to collectors would be a substantial improvement. Changes like that benefit everyone, but they particularly help black families. Policy makers should pay attention. Making it easier to recover from small setbacks can make a big difference in people’s lives.